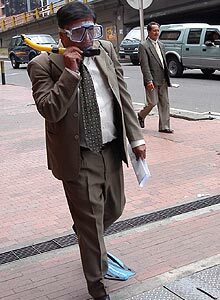 Gilberto Lozano, a criminal defense attorney in Bogota, Colombia, wore scuba gear over his business suit as he filed a complaint on Tuesday to protest the government’s treatment of his client. Lozano’s client is Carlos Jimenez, also known as "Macaco," a right-wing paramilitary leader and accused drug lord who has been arrested and is awaiting extradition. (A "macaco" is a species of monkey, so it seems that Sr. Jimenez goes by the terrifying name of "The Lemur." I guess it’s probably scarier if he’s killing you.) Jimenez was recently transferred to the brig of a Colombian Navy ship that is at sea, which Lozano says makes it fairly difficult for him to meet with his client. Hence the scuba gear. Lozano wore swim fins, an oxygen tank, and a diving mask over a brown suit as he filed a complaint with the national prison authority. "In no part of Colombia’s prison code does it say it is permitted to put a person in such a place," he said, lifting his diving mask to talk to reporters. "If I am going to see my client, I guess I’ll have to swim," Lozano continued, thus explaining his pretty obvious point. "It’s a good thing I’m from the coast myself." The Lemur is expected to be extradited soon to the United States, which raises the possibility that he might testify against someone or other. According to the government, anyway, he was put on the ship in the first place in order to keep other paramilitary leaders from killing him. So, possibly, if he did have a chance to meet with his lawyer, he would tell Lozano to just cut it out.